The waiting game is about to begin for some of the world's best big-wave surfers, as the window for holding the legendary Mavericks surf contest near Half Moon Bay is set to open on Friday. In order to hold the 2013-14 Body Glove Mavericks Invitational, ideal surfing conditions need to materialize at the famous break, located about a half-mile off Pillar Point, event spokeswoman Jessica Banks said. Waves higher than 30 feet need to break at regular intervals, with good visibility and low winds, Banks said. "It comes down to more than just the size of the waves," Banks said. "We can have 60-foot waves but the intervals could be off." There is no way to determine if the perfect conditions will materialize during the contest window, which falls between Nov. 1 and March 31. "Obviously, it's hard to tell," Banks said. "It's really what Mother Nature decides to give us." Competitors are given as little as 24 hours to arrive on the San Mateo County coast once the contest is called. Among the international group of two-dozen elite big-wave surfers invited to participate in this year's Mavericks contest is Brazilian surfer Carlos Burle, who on Monday was reported to have possibly surfed the world's biggest wave off the coast of Portugal. "It looked awesome," said Banks, who has watched footage of the event. 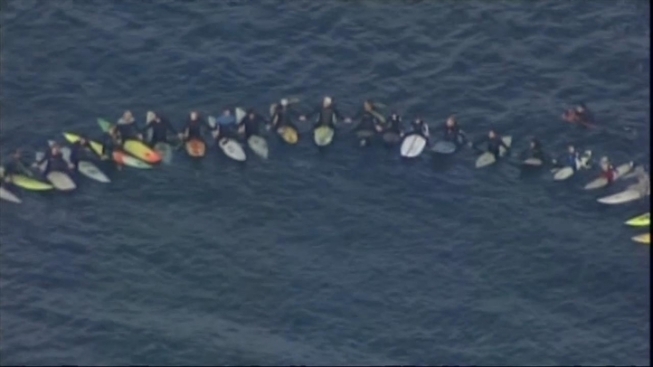 "We're excited to see if he did actually catch the biggest wave." Preliminary estimates put Burle's wave at about 100 feet, which would shatter the current record of a 78-foot wave surfed in 2011, also off the coast of Portugal, according to Surfline.com. Other surfers on this year's Maverick's roster include 2012-13 Mavericks winner Peter Mel, of Santa Cruz, and 2009-10 winner Chris Bertish, of South Africa. The beaches and coastal bluffs closest to the break will be closed to the public during the Mavericks contest to protect viewers from unpredictable conditions and preserve environmentally sensitive areas, Banks said. Anyone who wants to view the contest -- if and when it is called -- can purchase tickets to the Mavericks Viewing Festival, which will be held on the grounds of the Oceano Hotel & Spa in Princeton-by-the-Sea. General admission is $15, with some VIP packages available. Those looking to purchase tickets, find out how to live-stream the event or read up on Mavericks can visit the event website at www.MavericksInvitational.com.